DAYTONA BEACH, Fla. (Jan. 22, 2019) – Scotland’s Kyle Reid, the current SUNOCO 240 Challenge winner, makes his United States racing debut this Friday (Jan. 25) driving the No. 26 SUNOCO/Fast Track Racing/Classic BMW BMW M4 GT4 at Daytona International Speedway in IMSA Michelin Pilot Challenge season-opening event, the four-hour BMW Endurance Challenge race. Reid, 29, comes to North America for his first IMSA Michelin Pilot Challenge race after capturing the Cooper PRO Class title and the SUNOCO 240 Challenge during the recent season finale at Rockingham. Reid is the second Mini Challenge driver to win the SUNOCO 240 Challenge contest. On Dec. 13, Anglo American Oil Company Ltd, distributors for Sunoco Race Fuels throughout the UK, Europe and the Middle East, announced Reid would join the Fast Track Racing/Classic BMW team for the Jan. 25 BMW Endurance Challenge. Reid, driving his first rear-wheel-drive race car in competition this weekend, will team with veterans Jayson Clunie of Prince Albert, Sask., Canada and Toby Grahovec of Celina, Tex., in the BMW Endurance Challenge event in the blue SUNOCO BMW. The blue SUNOCO paint scheme for the No. 26 BMW M4 GT4 sports car will resemble the famed SUNOCO Penske Chevrolet Camaro driven by legendary Mark Donohue in the Trans-Am series in the late 1960s. Reid made his Daytona debut earlier this month in the IMSA ROAR testing session at the famed Daytona 3.56-mile road circuit inside the track’s oval. Kyle had to learn a variety of aspects with the new BMW M4 GT4 machine as well as working with Fast Track Racing and his two teammates. Clunie, who placed second with Grahovec last year in the Sebring Challenge race, also is anxious to return to Daytona for Friday’s BMW Endurance Challenge. “I am always excited to get to a race weekend with the Fast Track Racing/Classic BMW Team,” said Clunie. “The group has the knowledge and skills to prepare a car that is capable of winning each time out. The BMW M4 GT4 car has great pace during the course of a race. It’s very consistent through the runs and, in a four-hour race, that should be really good for us. All of the Fast Track Racing BMW cars are fast and a pleasure to drive. I’m looking forward to working more with Kyle Reid. His performance at the Roar Before the 24 was impressive and I know he is going to be quick when he comes for the race weekend. Grahovec just missed a podium finish last year at Daytona by taking fourth in the four-hour contest, and the Texas racer expects another strong showing with the No. 26 SUNOCO BMW M4 GT4 this Friday. “After a good test at the Roar, I am really looking forward to returning to the race in our SUNOCO Classic BMW,” said Grahovec. “The crew has been working diligently at our Texas race shop preparing the car for the race. We are excited to have Kyle return for the race. He performed well in his initial run with the BMW M4 GT4. I am confident that we will be successful at Daytona. The BMW Endurance Challenge will be contested from 12:15 p.m. to 4:15 p.m. EST this Friday and can be viewed live at https://imsatv.imsa.com. NBC Sports Network will telecast the race highlights on Wednesday, Feb. 6, at 1 p.m. EST. A couple of years after starting the main Sunoco Whelen Challenge, we introduced the Sunoco 200 Challenge which runs alongside the Sunoco Rolex 24 At Daytona. Since then it has captured the imagination of over 600 registered racers. In 2017 the name was changed to the Sunoco 240 Challenge to reflect the race change from 200 miles to a 240-minute endurance race and is increasingly becoming a talking point throughout the UK paddocks. It gives the winner the chance to compete in the BMW Endurance Challenge which takes place on the Friday before the Rolex 24 in a GT4 car in the top GS class – providing yet another opportunity for an aspiring racing driver to compete at the world-famous venue. The 2019 Sunoco 240 Challenge is run by Anglo American Oil Company Ltd. and provides the winner, from additional eligible series, with a race seat in a top GT4 car during the 4-hour endurance race on the Friday before the Rolex 24 At Daytona. Included in the prize is travel, hotel, the cost of the prize drive and a dedicated race suit for the winner. The driver who wins the challenge gains the full American experience by racing in a V8 muscle car. The qualifying series for the 2018 race season were the British GT3 & GT4 (AM Drivers), LMP3 Cup (AM Drivers), F3 Cup, Mini Challenge (JCW & Cooper), GT Cup, Britcar Endurance and the Radical Challenge, Radical European Masters (AM Drivers). SUNOCO Race Fuels are manufactured and designed on the east coast of America in Philadelphia. Sunoco is the largest manufacturer of race fuels in the World. Sunoco owns the whole manufacturing process, enabling 100% control from raw materials to finished product. Sunoco is the official fuel of NASCAR and has, since December 2003, been represented in Europe and in the Middle East by the Anglo American Oil Company Ltd.
Fast Track Racing is located at the Classic BMW headquarters in Plano, Tex., north of Dallas. Fast Track Racing has captured numerous race events over the past decade and was recently awarded the BMW Sports Award as the Top BMW Racing Team worldwide in 2018. It marked the first time an American racing organization has captured the prestigious award. In addition, the Fast Track Racing also won the Pirelli World Challenge Touring Car Team championship led by Karl Wittmer, Matt Travis and Jayson Clunie in BMW M235iR cars. 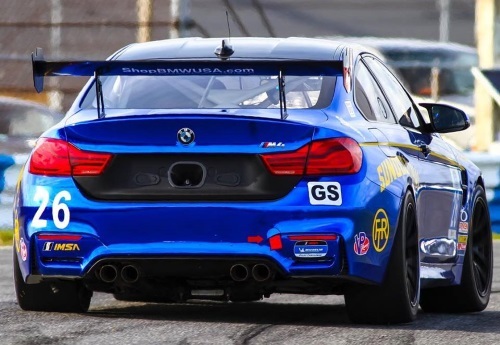 Toby Grahovec and Chris Ohmacht won two GTS Am SprintX division races in 2018 and finished third in the SprintX final points in the new BMW M4 GT4 sports car. Classic BMW heads up the BMW customer racing program in North America, with customer-built cars and has already captured a 2016 Touring Car driver’s title with Grahovec and the BMW M235iR car. The BMW M235iR racing sedan also won the Touring Car manufacturer’s championship in 2017 and 2018. Fast Track Racing will campaign BMW M240iR and BMW M4 GT4 machines in 2019.